The ZE-NC3811D is equipped with a digital 16.5 cm/6.5“ WVGA TFT HD LCD panel with LED backlight that ensures brilliant and crisp images of high contrast, due to its resolution of 800 x 480 pixels. The animated high-resolution ZENEC GUI allows „slide-touch“ operation of the touchscreen, for fast and simple control of all functions. Also the ex works provided steering wheel control is supported and retained in order to drive safely and comfortably. Control logics, grouping as well as neatly arranged system settings of audio, video, Bluetooth and Navi functions are key points not to be neglected, where Zenec can rightfully claim to possess the most user-friendly package of all A-brand sat nav devices available today. The integrated CD/DVD drive plays all current formats including the popular multimedia container format, Xvid. AVI files, music and videos can be acessed and played via USB, SD, iPod or iPhone – where APPLE album art is implemented in the audio playback menu as well. The ZE-NC3811D is equipped with a Parrot Bluetooth hands-free kit, where a new microphone with increased sensitivity is contained in the set. For users that prefer playback of music from their mobile phone, A2DP and AVRCP 1.3 is part of the BT functionality covered by this model. Apart from the convenient handling of imported phonebook contacts, the search function (with up to 15 letters) will make it that much more convenient to find an entry in extensive contact lists. The extended Bluetooth operation and settings menu allows direct access to five favorite contacts that remain upfront for quick dialling and easy editing. The current ZE-NC3811D E>GO has the latest maps of 43 European countries preloaded (with Premium POI's), which appear highly realistic, thanks to the 3-D high-definition rendering of terrain and 3-D objects. With 8 GB of flash memory more than enough memory remains free for continuous expansion and unlimited updates of map data and3-D buildings and landscape features. Zenec innovative navigation software makes the destination and route choice even easier and more intuitive. The quick menu provides straight access to all sat nav functions. The 'smart' and 'Eco' route calculation modes for shorter and / or more economical driving are hard to beat indeed. Part of the extensive feature set is the display of traffic information / guidelines when entering an EU country and the visual and audible warning to indicate speed limits on major roads. The TMC/TMC Pro function keeps you up to date regarding potential traffic jams on the chosen route, while automatic re-calculation of a suitable detour is a function covered as well. Just select the respective TMC function and you’ll get all relevant traffic messages on your map screen directly. Off the factory the TMC service is functional and free. The TMC Pro function requires a licence (lifetime) to be separately purchased through Naviextras (available for Germany, UK and France only). To activate the TMC Pro service you have two options: Either buy and download the license directly via www.zenec.naviextras.com with your credit card or purchase a prepaid activation card (ZE-NC-TMCPRO) at your authorized ZENEC dealer. Hi I'm looking for installation of this into a Ford Mondeo mk4, I see Zenec also have a DAB unit, can you quote me for this along with an upgraded speaker set for the car which matches the HU output? personally for the cost of this ford style system and the DAB addon you would be better off going for the avicf80dab and the parts to install it into your car and you would have a better product. 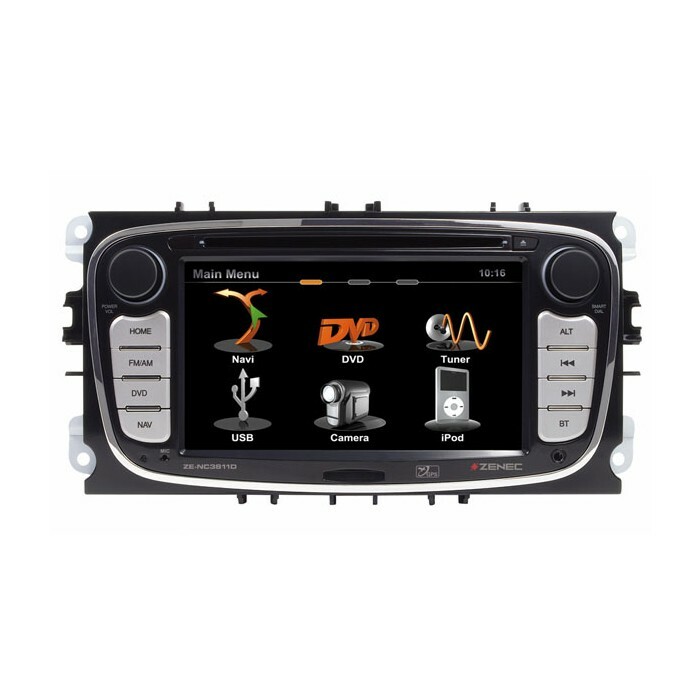 Hi, Does the Zenec ZE-NC3811D support full use of the ford connect+ dash display system ? I've heard most aftermarket unit cause the dash display to stop functioning. The Zenec will retain all functionality. See the below link for full specification.